Now, you can ensure your Guards' safety and health status by using the Man Down functionality of QR-Patrol! Guards and Lone Workers that need to perform patrols by themselves, without any close or direct supervision, don't have to worry anymore! Using Man Down functionality, the Monitoring Center can be alerted of any urgent situation, even if the Guards won't have the chance, the capability and/or the time to send out a S.O.S. event! 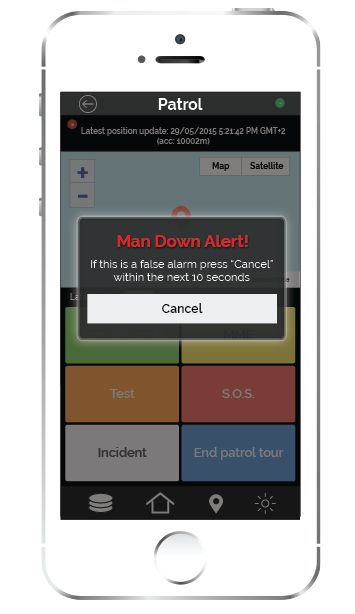 In more detail, Man Down Events are created automatically, once your device's sensors detect a vertical movement in space or an extreme acceleration in any direction. In the next stage, the system tests the movement of the smartphone and undo the previous procedure. If there is no movement or it is too smooth for the next 2 seconds, then a pop up dialog is appearing for 10 seconds. Within this time interval, the user can undo the sending of a Man Down event, by filling the PIN number. In case it’s a demo account, just press any button and the event will not be sent. Finally, there is an “Extreme Crash” functionality where even if a huge acceleration is detected -e.g. 50 m/s2, meaning an acceleration which equals to approximately 5 times higher than the gravity acceleration - to any direction, then a Man Down event is sent immediately without any pop up message warning before. Enable Man Down functionality through your web application for your Guards and give it a test! Go to your Guards tab, select any of your Guards and click on 'Edit' (or just double-click on any of them). Feeling anxious about organizing your patrols in a successful way? Get in touch with us to discuss how QR-Patrol guard monitoring system can help you automate your daily security business and manage your guard tours in a modern and efficient way!